The superstar of the keg industry. As it prepares to open its new, 100,000-square-foot, state-of-the-art Columbus brewery, Scottish craft beer pioneer BrewDog has chosen MicroStar to handle keg logistics in order to meet skyrocketing demand. 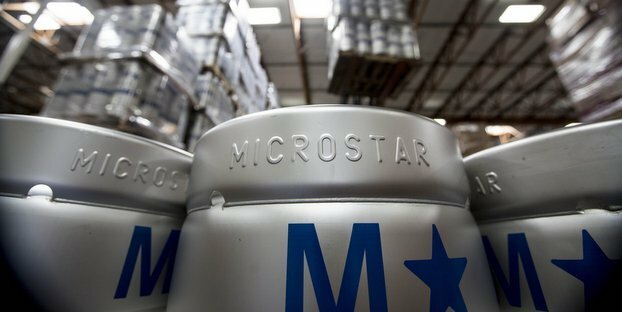 Over the course of 20 years, MicroStar has built the industry-leading pool of ~3 million kegs and relationships with approximately 1,400 beer wholesalers delivering the efficiencies and flexibility brewers of any size need to win in today’s competitive on-premise beer environment. In addition, MicroStar’s investments in regional quality managers, diagnostic equipment, proactive repair and maintenance, technology-enabled keg ordering and reporting tools, customer service personnel and new export solutions provide the foundation for strong, long-term customer partnerships. Looking for a compact, affordable robotic palletizer? Maybe with an automatic stretch wrapper?